Property Message Address Plaque - 3 Line Vertical Sign - - custom made with an address number, name, or short word with super-size 4.5" characters and two lines of text. 14" wide x 19" high. Wall mount. Made in USA. Wall mount rectangle sign features eye-catching extended double corners. Dimensions: 14"W x 18.85"H x 0.375". Custom made three line property message sign. 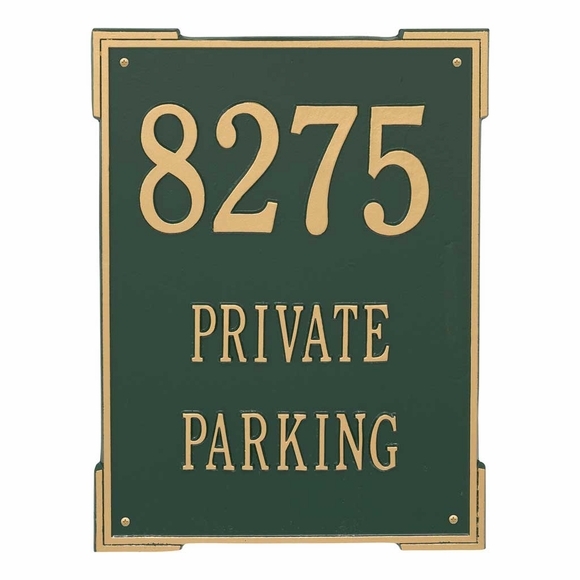 See Related Products for additional personalized property information signs.